I am one of those people who eagerly anticipates shopping for school supplies. It's not that I am desperate to see my daughter return to school, there's just something about brand new notebooks, pencils, and folders that has always set my heart aflutter. So now that I have confessed secret love of stationery, I can also admit that my daughter and I finished her back-to-school supply shopping... in July. Seems like maybe my affinity for binder clips and post-its is inherited, but I digress. The point is, we scored some amazing deals by shopping at the beginning of school supply season; deals that allow even me to donate without breaking my rather modest budget! In our town (as in most, I imagine), we have an annual drive for school supplies that are distributed to children's charities; items are collected and provided to children who may otherwise have done without, or sometimes to classrooms where they are provided to children in need. It's a fantastic way to make certain all our students get off to a good start by feeling prepared and equipped to take on a new school year! It's a cause that's near and dear to my heart as a parent, and I encourage everyone to participate if you can. It can be as inexpensive as a 50-cent package of index cards, or as generous as a $50 giftcard - every little bit helps. If you are a fan of coupons, many times you can even score items for free! If you wish to help, but are uncertain what to get, a gift card is always a good choice. 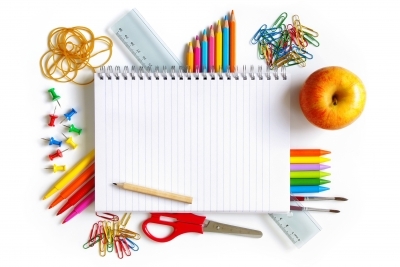 Generally speaking, however, if you walk into any office supply, pharmacy, food, or bog box store during the months of July, August, or September, you can't miss the school supply sales. They may even have a list of items that are needed, or a collection box for donated supplies! Providing even one item can truly make a difference for a child in need. So this year, when you head out to go supply shopping, pay it forward with an extra notebook, or folder, or box of crayons - your donation could inspire a child and help pave the road to a love of learning!